Aggie Habitat for Humanity is the Texas A&M Campus Chapter of Habitat for Humanity International and works closely with B/CS Habitat. 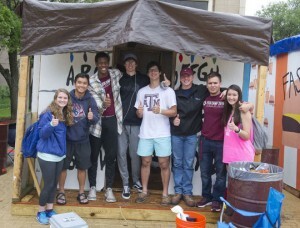 Every year, Aggie Habitat works to increase awareness about affordable housing in the Bryan/College Station area at Texas A&M and raises money to sponsor and build a decent and affordable home for a deserving low-income family in our community. Aggie Habitat meets bi-weekly during the school year. The first meeting for the ’18-’19 academic school year is TBD. 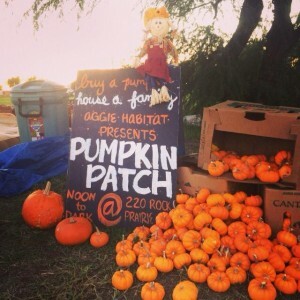 Aggie Habitat’s two flagship fundraisers are Pumpkin Patch in the fall and Shack-A-Thon in the spring. 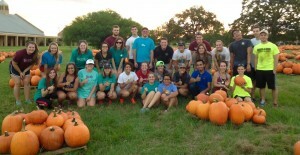 The Aggie Habitat Pumpkin Patch site is located on Covenant Presbyterian Church’s grounds in College Station and sells over 3,000 pumpkins of all shapes and sizes every year! Shack-A-Thon is a week-long advocacy event in the spring, held at Rudder Plaza on the Texas A&M campus. 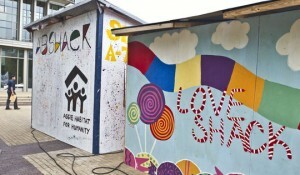 Different student organizations bid for spaces to build a shack. During Shack-A-Thon week, student organizations enjoy entertainment and educational events put on by student performers, members of B/CS Habitat, Habitat International and members of the community. This event is a way for Aggie Habitat to raise poverty housing awareness among students and serves as a great fundraiser at the same time. 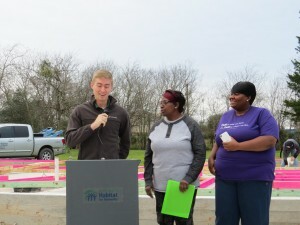 For more information on how to get involved with Aggie Habitat, click here.